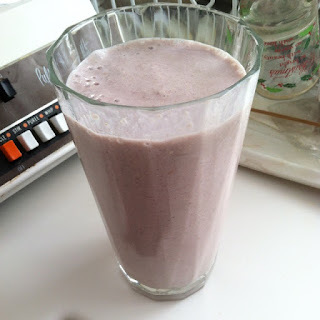 That scheme to sell soy protein shakes to embassy construction site security guards which got a couple of my good friends in OBO prosecuted (here) makes more sense now. Diplopundit has posted news of a settlement between the U.S. government and Coastal International Security, an OBO contractor for site security personnel, in which we learn that the contractor was obtaining inside information on its competitor's bids and pricing at the same time it was helping its OBO program manager - one of the people who oversaw Coastal International Security's contract - to defraud the government in his own, separate, tasty and nutritious conspiracy. Coastal International Security, Inc., based in Upper Marlboro, Maryland, agreed to pay a total of $1.65 million to resolve criminal and civil allegations that the company defrauded the State Department during performance of a security contract and later concealed the fraud from contracting officials, and civil allegations that the company improperly obtained and used competitors’ pricing information to underbid competitors on government task orders. The government’s investigation focused on the relationship between Marvin Hulsey, a former program manager for Coastal International Security, and Tony Chandler, a former contracting official of the State Department. According to court documents, Hulsey and Chandler conspired together to submit false invoices to the State Department for unallowable costs of nutritional supplements. 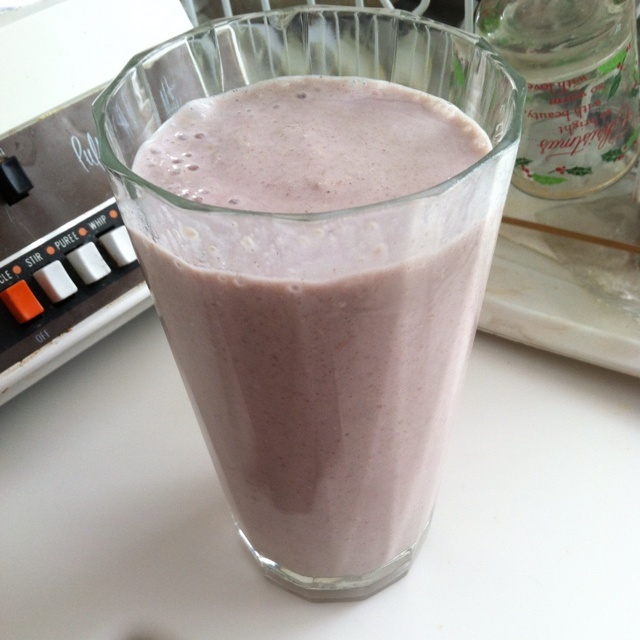 Chandler, as an authorized distributor of the nutritional supplements, received commissions from the approximate $170,000 in fraudulent nutritional supplement billings. Independent of this scheme, Hulsey admitted to causing approximately $140,000 in additional fraudulent billings through a company owned by his wife. Coastal International Security simultaneously agreed to pay $1.5 million to resolve civil claims under the False Claims Act for the above conduct, as well as claims under the Procurement Integrity Act arising out of Coastal International Security’s knowledge and use of a competitor’s publicly unavailable bid proposal information. The competitor’s information allegedly enabled Coastal International Security to underbid the competition on bids that Coastal International Security made between Nov. 4, 2008, and Oct. 7, 2011, in connection with various Department of State task orders. So, Chandler made a comparatively small score by allowing Coastal International Security to bill the government for nutritional supplements that he sold to their employees. Meanwhile, Coastal, which now had a lock on Chandler, used it to obtain inside information with which it could make a much larger score by underbidding its competitors. The whole story is way more depressing than when I thought it was merely a pyramid scheme run amok. 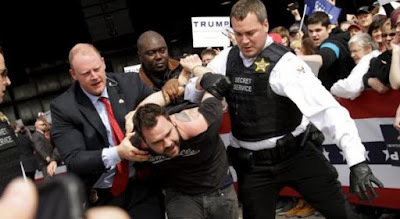 That guy who tried to jump on the stage at the Donald Trump rally in Dayton, Ohio, was charged in Montgomery County with misdemeanor disorderly conduct and inducing panic, and released a few hours later after posting a $300 bail. His name is Thomas Dimassimo, age 22, a senior at Wright State University. The Dayton Daily News has an actually informative report on him here: Suspect preplanned to interrupt Dayton Trump rally. The protester who rushed the stage at Donald Trump’s campaign rally in Vandalia told police he “preplanned” it, according to a police report obtained from the Dayton Police Department. 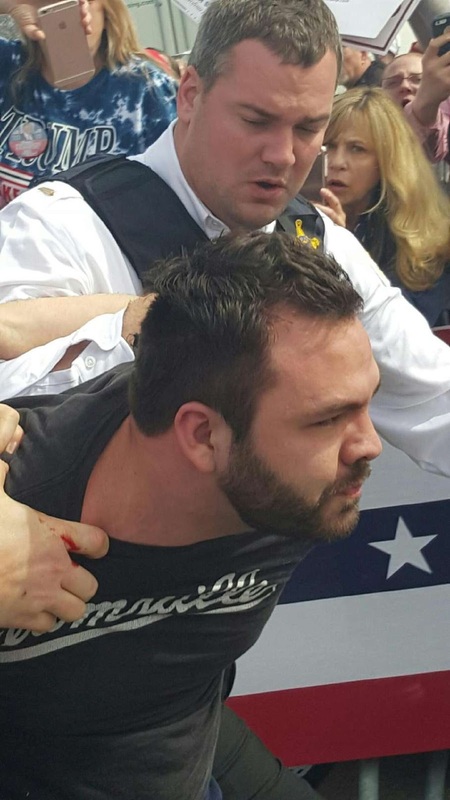 After he was booked into the Montgomery County Jail, Thomas DiMassimo, 22, told police all he planned to do was run up on stage, take the microphone and yell, “Donald Trump is a racist,” the report states. DiMassimo told police he “had no intention of hurting anyone” and said he “preplanned” the incident because “he gave his keys to his girlfriend to take his car home before the rally,” according to the report. One of the Secret Service agents reported that he saw DiMassimo “grab an unknown citizen by the shoulder and pulled him out of his way,” before jumping the metal fence and run toward the stage, the report states. DiMassimo was taken down about four feet from the stage and a Secret Service agent “busted his own nose as he fell on top of DiMassimo” while attempting to handcuff him, according to the report. DiMassimo was charged with “inducing panic because he created a situation of panic among approximately 5,000 citizens,” the report said. He was also charged with disorderly conduct “because he engaged in a conduct that caused inconvenience, annoyance, and alarm to citizens and Donald Trump that had an effect which interrupted the speech,” according to the report. Viral videos and Facebook pages by his detractors notwithstanding, the guy has no connection to ISIS. Only slightly better than being connected to ISIS, however, "Tommy" DiMassimo is a former child actor. Plus, he has a history of protests that suggests his attention-seeking days are not over yet. Symptomatic of his confusion over life role models, he evidently goes by the name Marlon Brando @younglionking7 on Twitter. Huh? Brando was an adult actor, and The Lion King was a cartoon baby animal. You can't be both. Tommy, pick a life and stick with it. Whether another Brando or The Lion King, he came close to not getting any older when he rushed to within four feet of a Presidential candidate. That kid probably has no idea how lucky he is not to have been shot by jumpy police and Secret Service agents. 'I thought maybe that some ice would solve the problem, but he insisted on calling an ambulance. He was pretty annoyed.' . A recent comment on The Sounding Board questioned the extent of compliance with National Foreign Affairs Training Center policy regarding the carrying of weapons on campus. That made me curious because, generally, all Federal properties come under Title 18 U.S. Code Section 930 which prohibits firearms and other weapons. Who didn't know that? Follow-up comments on the Sounding Board showed that lots of people didn't know that, and some of those people are DS agents. I looked up NFATC's Section 1-168 (Weapons Policy at the Shultz Center) to make sure. Turns out, yeah, it does apply to DS agents and other Federal Law Enforcement Officers. No weapons allowed on campus for them. Federal law prohibits the possession of firearms or other dangerous weapons in Federal facilities and Federal court facilities by all persons not specifically authorized by Title 18, United States Code, Section 930. Violations of 18 U.S.C. 930 may result in criminal penalties and/or disciplinary action. A dangerous weapon is defined as a weapon, device, instrument, material, or substance, animate or inanimate, that is used for, or is readily capable of, causing death or serious bodily injury, except that such term does not include a pocket knife with a blade of less than 2 1/2 inches in length. No one may bring firearms or other dangerous weapons into Federal properties, including parking lots, grounds, and buildings, except for law enforcement personnel specifically authorized to be armed in Federal facilities by 18 U.S.C. 930. Law enforcement personnel who are authorized to be armed in Federal facilities by 18 U.S.C. 930 and who are actively conducting law enforcement activities in the facility that require them to be armed may carry weapons in the facility. All other law enforcement personnel who are carrying weapons, but not performing law enforcement functions in the facility, must check in with the facility security officer to receive directions concerning storage of their weapon. The policy notice I saw stated it had been "Reviewed Feb 2016" which makes me suspect that there have been recent incidents of employees or students at NFATC seeing weapons, maybe in the possession of other students, and reporting that to school authorities. 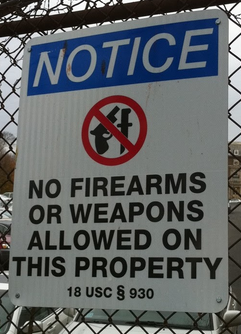 Is this policy of banning law enforcement officers from carrying weapons on campus a good idea? NFATC is a soft target in comparison to most Federal properties in the Washington DC area. Given the threat of active shooter attacks - see, for instance, the Washington Navy Yard shooting and the Fort Hood shooting - should the State Department reconsider the policy of banning everyone from carrying firearms on campus? This is a difficult issue for many institutions. Even military bases have normally banned other than active duty law enforcement personnel from carrying weapons. Speaking as a former Military Police officer, I can think of a hundred reasons why general concealed carry on-base would be a disaster waiting to happen. But, there are some highly sensible new policies about on-base carry that strike a good balance between safety and timely response to active shooters. Am I completely crazy to think that the State Department should consider revising its policies about firearms in the workplace to incorporate lessons learned from the Navy Yard, Fort Hood, and other such incidents? I'm still curious about how the policy about firearms on the NFATC campus came to be reviewed, and reminders sent out. I can only guess that some agent-students were carrying their duty pistols with, ah, less than complete discretion. Gentlemen, lose the duty holsters and look into tuckable inside-the-waistband holsters, pocket carry, and even the Old School ankle holster (it was good enough for Popeye Doyle back in the 70s). Why needlessly alarm the hoplophobic among us? And then there is the matter of pocket knives, which are also covered by Title 18 U.S. Code Section 930. I was surprised to learn that my Mini-Griptilian is not legal on Federal properties because it exceeds, just barely, the 2.5-inch blade limit. My Leatherman Skeletool is fine, however. I carry them both daily. Plus, I carry a small Swiss Army Knife just for occasions when I want to open a package or something but don't want to upset people whom I suspect might be alarmed by my little Griptilian. Such people exist, and I don't think the workplace is the right venue for arguing these issues. Whether it's your pistol, my knife, someone else's pepper spray, or blowguns, nunchucks, or Ninja throwing stars, carrying them on Federal property isn't a civil right, it's just a practice regulated by law and policy. Let's review that policy. But meanwhile, why needlessly upset any of our fellow employees? Why Kill the Messenger When You Can Kill the Message Instead? I just watched the video of a talk on drone warfare that was delivered a couple weeks ago by Scott Shane, a NYT reporter and the author of Objective Troy: A Terrorist, a President, and the Rise of the Drone, which is embedded above. You can read an account of the talk here: The Pros and Cons of Drones in Counterterrorism. In addition to discussing drones as a counterterrorism tool in place of a strategy, Shane also pointed out the hugely counterproductive result of killing Anwar al-Awlaki, the premier Islamist propagandist, and U.S. citizen, who had fled the United States for Yemen. So, our whacking of al-Awlaki, while it might have given us some emotional satisfaction, resulted in amping up his message and giving it the added authority of coming from a martyr to the cause. A big backfire. And this massive fail occurred despite all the hoopla about countering violent extremism, or counter radicalization, or strategic messaging, or information operations, coming from nearly every agency of the U.S. government today. Are we serious about countering the messages of an al-Awlaki, or are those just buzz words used in budget justifications and grant requests? 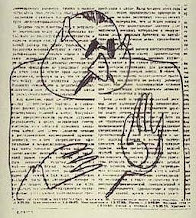 To make matters worse, the USG had the means all along to kill the message itself by discrediting the messenger and causing him to lose credibility with his audience. Al-Awlaki, it turns out, patronized prostitutes like he was a Secret Service agent on TDY in Thailand. But more than Muslim persecution motivated his abrupt departure. The FBI had been surveilling Awlaki because two of the 9/11 hijackers had attended a mosque he led in San Diego. By monitoring him 24/7, the FBI had concluded that he was not, at that time, affiliated with al-Qaeda. They had, however, observed his un-Islamic secret—that he enjoyed the regular company of prostitutes. His fear of being discredited before his conservative followers was the greatest influence in his decision to leave, Mr. Shane learned from Awlaki’s brother and newly declassified documents. Awlaki discovered the FBI had found him out from a Washington madam, who called him to complain he had brought scrutiny upon her business. There is also another angle that could have been pursued had the USG cared to deal with al-Awlaki as a political threat. It seems his U.S. citizenship might not have been quite completely legal. Back in 2002, Diplomatic Security Service Special Agent Fournier had initiated a passport fraud case against al-Awlaki. The U.S. Attorney in Denver issued an arrest warrant in that case, but ultimately declined to pursue a prosecution. Another opportunity lost. Had we revoked his citizenship and deported him back then, that might have disrupted some of al-Awlaki's subsequent operations. At the very least, it would have relieved the legal and political embarrassment that resulted from the USG targeting him for an extrajudicial killing. As Casey Stengel said to the 1962 Mets, can't anybody here play this game? This is why it matters that the USG has a law enforcement agency where we need a security agency, something along the lines of the British MI-5 or Israel's Shin Bet. An agency that seeks to infiltrate, control, disrupt, counter, frustrate, confuse, render ineffective, or otherwise deal with - even extrajudicially - threats to national security. Instead, we have lawyers and law enforcement agents who apparently just cannot get on the same wavelength as our sub-state adversaries. 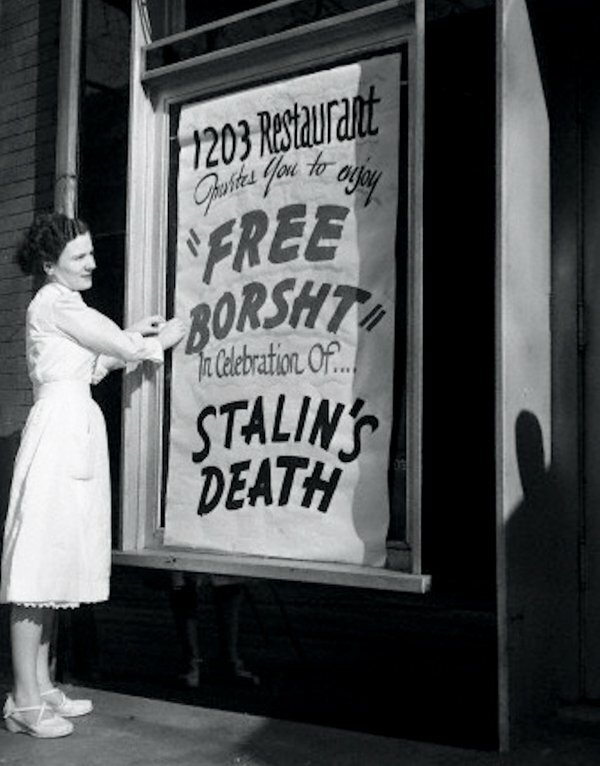 A Washington DC restaurant offered free borscht to celebrate the death of Stalin, which occurred on this day in 1953. 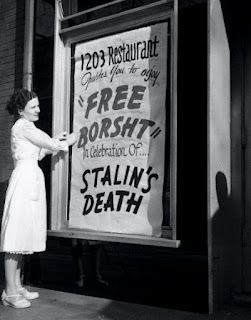 I think I can find something more celebratory than borscht. There's some Ukrainian vodka I've been saving, and that might be appropriate. Carl Bildt, former Prime Minister and Foreign Minister of Sweden, has drawn upon "the international community’s interventionist wisdom" (?? ), so famously gained in Bosnia, Afghanistan, Iraq, and Libya, to advise the world on how to build yet another state, this time in Syria. Lesson 1: Establish a secure environment fast. Lesson 2: Focus on state building first. 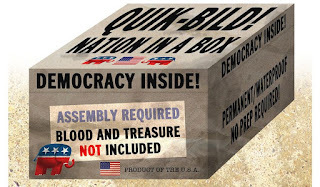 Lesson 3: Know what kind of state to build. Lesson 4: Focus early on the preconditions for long-term economic growth. Lesson 5: Nurture a benevolent regional environment. Lesson 6: The greater the international support, the easier the process. Lesson 7: Nation-building takes time and resources. I especially like the one about nurturing a benevolent regional environment. In the region around Syria? Good idea! I'm sure people will get right on that. Isn't this sort of list normally preceded by the words "Dear Santa?"